Latest blog post from our digitisation intern, Kirsty Early. Today, there are a variety of methods that enable us to visualize objects of microscopic proportions, from electron microscopes to light microscopes. However, the physical mechanisms of magnification were once a mystery to the human race. Thousands of years ago, it was understood that water affected the view of an object. This was due to the manner in which water interacted with light, a concept known as refraction. Years later, philosopher Robert Bacon described the magnifying properties of lenses . His major work Opus Majus was a milestone in the field of optics, with the first optical microscope being developed in the 16th century. 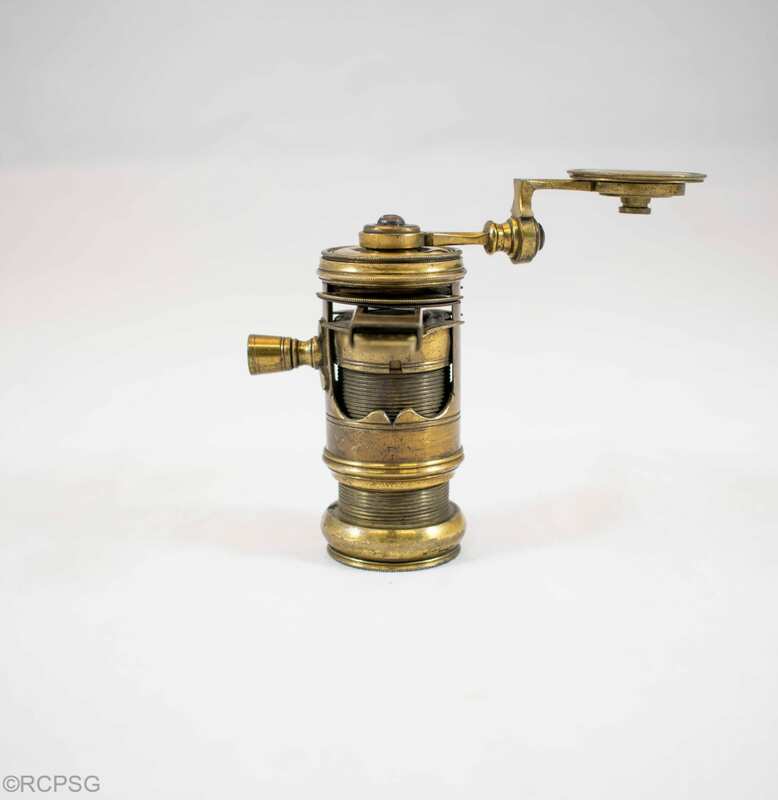 Within the College’s museum collection are several types of microscopes from the 18th to 20th centuries. Designs vary, which reflects the progression and improvement of microscopic technology. The Wilson-Type Microscope was designed by James Wilson in 1702, not as replacement for other microscopes, but simply as an alternative magnification tool . Samples to be examined were placed onto a slide containing lenses of different magnification strengths. 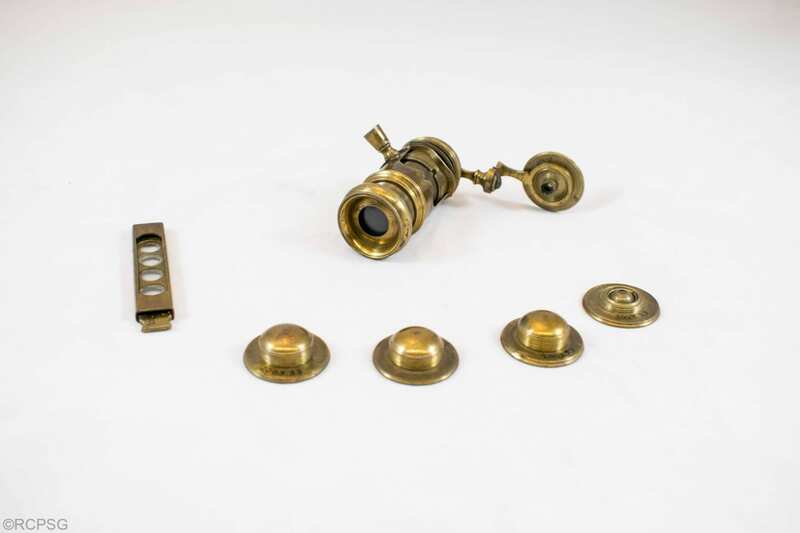 The position of the eyepiece could then be manipulated by a screw-mechanism, allowing the viewer to see different components of the target object more clearly. Also within the collection is a Culpeper-style microscope (1725), whose design is not dissimilar to a Galileo microscope. Edmund Culpeper was an English instrument maker in the late 17th century. 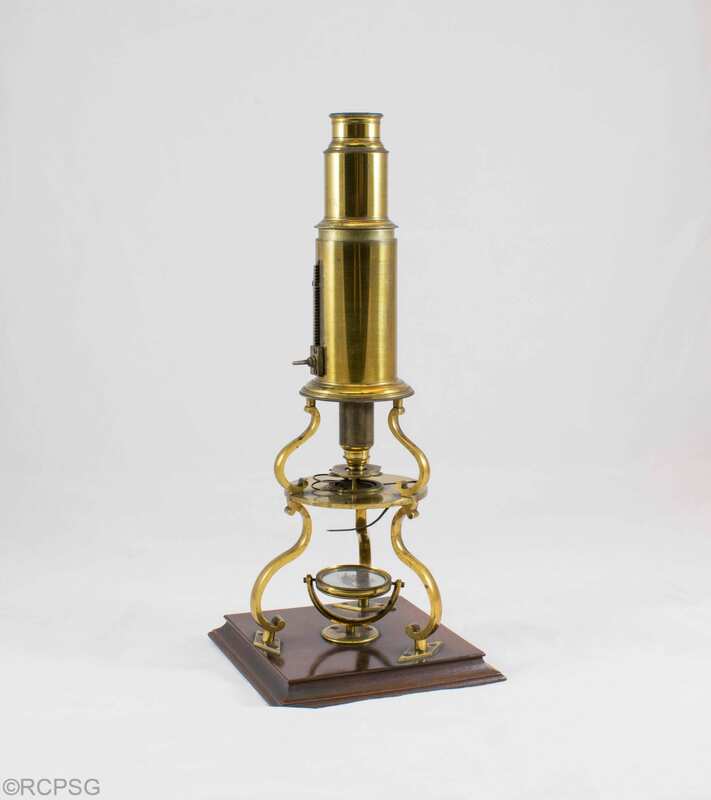 Although having made simple microscopes before, his personal design included a compound microscope with a tripod stand . The tool was so popular that it continued to be manufactured for the next century . The College has many resources on the life and works of Lord Lister, the pioneer of antiseptic surgery, but it also contains an example of his father’s work. 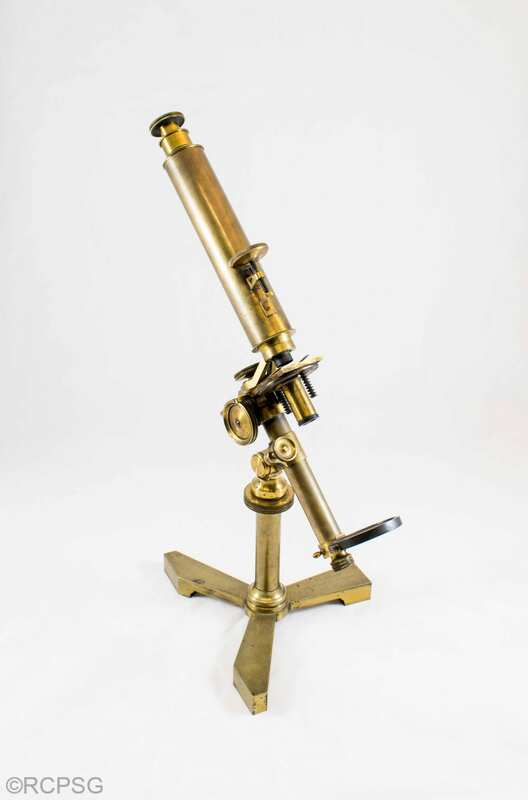 Pictured below is an achromatic microscope manufactured by Andrew Pritchard, an optician and instrument maker of the mid-1800s. Joseph Jackson Lister, Lord Lister’s father, was a wine merchant with an interest in the study of optics . His creation of a more accurate achromatic lens allowed for higher resolution viewing, and earned himself a fellowship in the Royal Society. Achromatic lenses focus light of different wavelengths in the same plane, hence producing a sharper microscopic image. This development in microscopic technology was truly revolutionary . 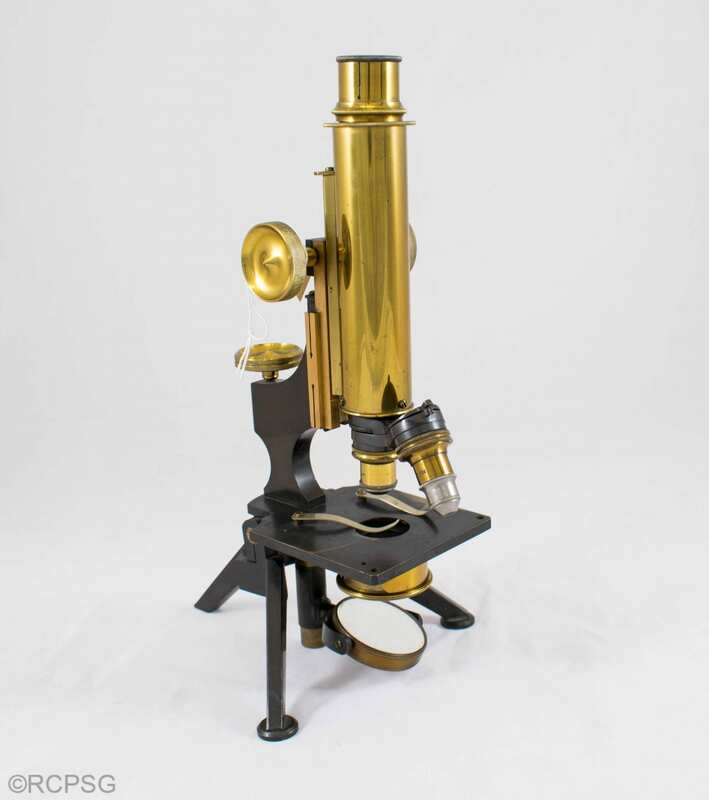 The final example of microscope within the College collection is a monocular microscope from the 1900s.This microscope is most similar in design to those seen in laboratories today, although many today will be binocular. It contains a stand onto which a microscopic slide is mounted, kept in place by two pegs on either side. The light mechanism from the bottom is directed through the lens by a mirror, which reflects the light of its surroundings. Unlike the other microscopes, this model contains a simple switch mechanism that allows the magnification to be altered between 2/3” and 1/6 “. Before the invention of the microscope, the only observations of the body were those visible to the human eye. However, under the microscope a whole new world was discovered. 1. Bacon, R., 1267. Opus Majus. 2. Wilson, J., 1702. The description and manner of using a late-invented set of small pocket microscopes, made by James Wilson; which with great ease are apply’d in viewing opake, transparent and liquid objects: as the farina of the flowers of plants etc. The circulation of blood in living creatures etc. The animalcula in semine, etc. Philosophical Transactions of the Royal Society, 23, pp. 1241-1247. 3. 3. Clay, R.S., and Court, T.H., 1925. The development of the culpepper microscope. Journal of the Royal Microscopal Society, 45(2), pp. 167-173. 4. Allen, E., and Turk, J.L., 1982. Microscopes in the Hunterian Museum. Annals of the Royal College of Surgeons of England, 64(6), pp. 414-418. 5. Bracegirdle, B., 1977. J.J. Lister and the establishment of histology. Medical History, 21(2), pp. 187-191.